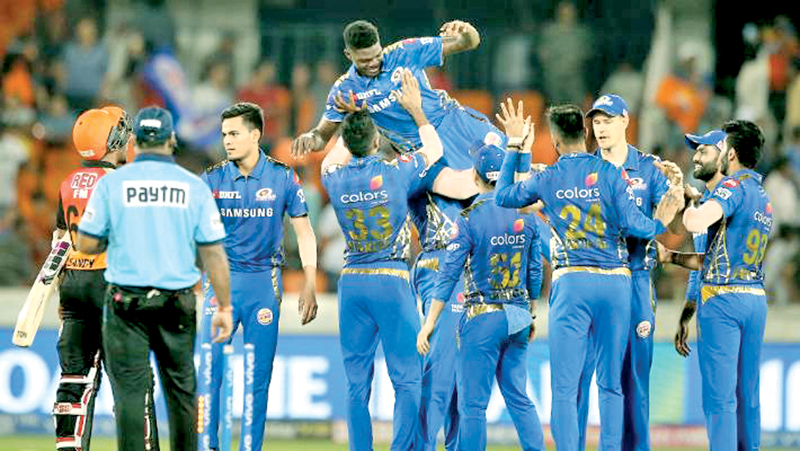 West Indies paceman Azari Joseph is lifted by his Mumbai Indians team mates after he bowled then to victory over Hyderabad Sunrisers with the best ever figures on IPL debut taking six wickets for 12 runs. HYDERABAD, India, Saturday - West Indies fast bowler Alzarri Joseph enjoyed a dream Indian Premier League debut for Mumbai Indians on Saturday after returning best ever figures of 6-12 in the Twenty20 tournament. Warner’s opening partner Jonny Bairstow of England also had an ordinary day with the bat, scoring 16, after falling to leg-spinner Rahul Chahar, who took two wickets. Earlier, West Indies batsman Kieron Pollard smashed an unbeaten 46 off 26 deliveries to give three-time champions Mumbai a fighting 136-7 after they were reeling at 97-7.